During the last three months, Yemen was afflicted by increasing tensions that seriously compromised progress in a range of political and human rights areas. Tensions began to grow in June and July 2014, when an armed offensive was launched in Amran by members of the popular committees who were affiliated with a hostile movement. Those clashes reportedly resulted in at least 204 casualties and the displacement of tens of thousands of people in June and July 2014 alone. The war in Yemen, which entered its fourth year this month, has displaced more than 60,000 people across the region, including 38,000 to Djibouti and 5,000 in Somaliland, according to the UN Refugee Agency, or UNHCR. According to the UN, some 10,400 Yemenis have registered as refugees in Jordan, a country already burdened with 1.3 million Syrians. An additional 500 Yemenis are requesting asylum in the kingdom each month. Some Yemenis were already residing in Jordan when the Saudi-led military campaign in Yemen began in March 2015. These Yemenis were studying, working, or receiving medical care. But many arrived after the war began, with Jordan being one of the few countries in the world to open its borders to Yemeni refugees. 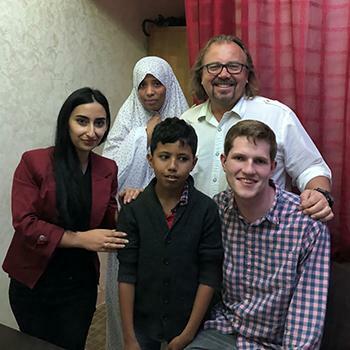 As registered asylum-seekers, Yemeni nationals in Jordan receive free access to Jordan’s public schools, international protection under the UN, and are eligible for winter cash assistance from the UNHCR to pay for heating, but not much else. Yemenis must pay the higher foreigner rates when seeking medical assistance or care at public hospitals and health centers. They are largely barred from working. Work permits for Yemenis are few and their requirements are steep. Yemenis must prove they have skills not available in the Jordanian market, have a Jordanian sponsor and legal guarantor, a valid work contract, and can afford the 800 dinars (about $1100) annual work permit. We are happy to know that there are Yemeni refugees in Jordan, because we've always wanted to reach out to the Yemenis but there was no way. It wasn’t possible to go to Yemen and reach its people. That was not an option, but now we have them right here. Our journey with the Yemenis started when a refugee came to our office asking for some help. He started sharing about the Yemeni refugees and their situation here in Jordan. He said there are a lot of refugees here who are in need and no person or entity is paying any attention to or caring for them. Our mission is to bring help and hope to the hidden and the hurting from any background or nation. A friend of a Steven Team member, who is a Yemeni refugee, approached him and helped him gather and collect some information about the refugees living in the neighborhood close to the GHNI office. They brought us 100 UN papers, and we immediately started to go on home visits to build relationships with these refugees. *Sheyanne is a Yemeni widow living with her son. She left Yemen because of the bad situation and the violent assault on women. Sheyanne’s husband was one of the men who were defending and fighting against the violent group, but she lost her husband while he was fighting. She was afraid for her son, so they came to Jordan. She can’t work because as a refugee she is not allowed to work. She is living at the nurses' residency with her son. She doesn’t pay any rent, but she is cleaning, cooking, and taking care of the house in return. Her son wants to be a pilot when he grows up. His desire is to go to Canada to continue his education and take care of his mom. Sheyanne doesn’t have any family here and there is no one asking about her or taking care of her and her son. She is on her own here. When we visited her the second day, she was depressed and hopeless. We talked about hope for the future and encouraged her to bring hope back into the picture. We tried to help her see that she is important and not alone in this world. We gave her some reading material to help her have a more positive outlook on the future. In our new clinic, we treated fifteen Yemenis patients for the first time. We have connected with a young lady by the name of *Nyree. She is from Yemen and one of our staff members met her during a home visit. She suggested Nyree volunteer with us to help reach the Yemenis who need medical treatment and arrange to bring them to the clinic. Nyree shared with us the feedback of the patients. They were super surprised by us. They were afraid at the beginning, as they didn’t know who we (GHNI) were or what we were doing. When they came and dealt with our volunteers and team, they said we were kind, loving, and gentle. They were relieved and felt more comfortable with us than they expected. They even said that they will send their families to us without any hesitation or concern. *For the purpose of safety and well-being, “Sheyanne” and “Nyree” are pseudonyms for individuals being helped by the project.